With the release of Ubuntu 16.04 it was time to do some maintenance on my home ESXi server. This server is a small variation of the Baby Dragon II and is so low maintenance that I even forgot what version of ESXi it was running. But, I did remember that you could actually download the Vsphere client from the home page from the ESXi server. Turns out I was running ESXi 5.1.0 and the installer did not work on Windows 10. As a workaround I used 7zip and extracted the installer. 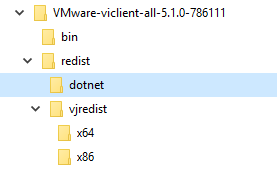 In the .Net folder you can run the dotnetfx35.exe but Windows 10 will tell you that an older version of .Net is required by a program and will install it for you. Next, install the Visual J redistributable and you are ready to run the installer in the bin folder. Now it is time to start upgrading my Ubuntu 12.04 instances to Ubuntu 16.04 and maybe even replace the Solaris Open Indiana ZFS with the Ubuntu 16.04 ZFS. Pureftp is a simple and secure ftp server that supports virtual users that can be chrooted. That was I was looking for when I needed to provide some external access to my home server. However, as often, on Ubuntu things work a bit different then on other platforms and the documentation I found was only partial. The basic installation is simple, then the documentation mention you need to create one user that can be used by all the virtual users. Before creating any virtual users you need to change the settings. The way the settings work is that the /etc/pure-ftpd/conf contains files that specify the settings. To enable the ChrootEveryone option you need to create a file with that name with the contents “on”. What took me the longest to figure out is that the virtual users authentication is not enabled by default. To enable this you need to create a link in the auth folder to the PureDB. Make sure that the -l puredb:/etc/pure-ftpd/pureftpd.pdb is present, this is the option for the virtual users authentication and the - A as this is the chroot option. After this you can login with the newly created user. I was looking for a easy way to put highlighted code fragments in word documents or powerpoint presentation. Then I came across this website. It is just a great tool to quickly get some nice looking code fragments in your Word/Powerpoint and even Outlook email messages. It is always tricky to setup jenkins properly when running under Windows. There are a few things you need to take care of. In this post I will assume you are using the bash shell delivered together with git. Start a bask shell under the new user. ssh uses the HOME environment variable to locate the .ssh folder that contains the ssh keys. If this folder is not present it will default to C: which is not a good place to store your keys. So it is very important to add this HOME variable for a stable functioning of jenkins. If you can not actually log in using the jenkins account you can still set the variable using the registry. The Windows runas command will be used to allow us to add the environment to the user jenkins even when we are not logged in as such. runas /user:jenkins reg add KEY  /v HOME /t REG_SZ /d "C:\Documents and Settings\jenkins"
Next we start a bash shell to check the HOME var and create the ssh key. Your identification has been saved in /c/Documents and Settings/jenkins/.ssh/id_rsa. Your public key has been saved in /c/Documents and Settings/jenkins/.ssh/id_rsa.pub. Now the ssh has been setup properly you need to change the service user from the Local System account to log in as the user Jenkins. Lastly, restart the service and Jenkins should be using the correct ssh credentials. Next you need to commit and push back to Gerrit. Ofcourse make sure you have the appropriate rights. I was trying to install Openindiana using the Supermico AOC S2308L-L8i HBA but I was unable to get Openindiana to recognize the card. At this point I decided to cross flash the card to the LSI SAS 9207-8i firmware that uses the same controller. As a back up I downloaded the original Supermicro firware from there ftp server. In the original firmware there is a nice script for UEFI boot that shows you how to flash the card. To flash using the LSI firmware you just need to replace the 2308IT14.ROM with the 9207-8.BIN. Copy the script and the 9207-8.ROM and mptsas2.bin into the same folder and you are good to go. Tomcat is running headless. Add this -Djava.awt.headless to /etc/init.d/tomcat7. Checked, was there already so this is not the cause. Used Sun Java. Hmmm, indeed I just installed tomcat and let the dependencies automatically install. Should have used the sun java. Ok, installing the ttf-dejavu fixed the issue! Next time I will make sure not to use the open-jdk but the sun-jdk to prevent this issue. create dir /etc/apache2/ssl and copy you ssl files to this folder. Update /etc/apache2/sites-available/default-ssl or create a new site. Make these changes to the site config. Now you should ssl working and it is time to add the subversion proxy. Make sure you proxy https to https. Mixing http and https will cause problem later on when performing copies in subversion commits and they will fail. I am running a small Ubuntu server that I have just given 8GB of virtual HD space. I thought that would be enough. However, as I was trying to transfer some data to it I ran out of space. This left me wondering what happened. I went to search where the data was stored and it was in /var/cache/apt. It contained 560MB. This is what I did to clean it. Cache reduced a little bit to 545MB, clearly that was not what I was looking for. Time to wipe out the cache! Almost enough space now, but not quite. What else was taking up space. The /usr/src contained 1.2GB of linux headers of all previous kernels that were installed. Just make sure you have rebooted since your last kernel upgrade!